Well, not that first family. This morning European Focus had the pleasure to welcome first time Germany travelers Amanda and Sara Howard and their mom, Kim Daugherty along with now three time Germany visitor Perry Daugherty to Frankfurt for the start of their 8-day jaunt around Bavaria and parts of Austria. 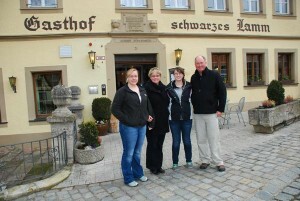 This tour starts the 2012 season for us in style, with a two-night stay in medieval Rothenburg ob der Tauber. Before getting to the heart of the town and the hotel, guide James Derheim took the family to our favorite country inn, the Schwarzes Lamm in the hamlet of Detwang. The restaurant is “new” compared to Detwang, having been built in the early 1800s. The village has been around for another 900 years, having been founded in about 980 as a way station for pilgrims on their way to Santiago di Compostela, burial place of St. James in Spain. We’ll be exploring more of Rothenburg in the next day or so, then we head south along the Romantic Road to Schwangau and from there, deeper into the Austrian and German alps. Follow along as we start the new season with a Big Adventure for this family from Iowa. Posted in Austria Tours, Germany Tours, Private Tours in Europe and tagged bavaria, detwang, family, germany, private, rothenburg, tour.